UK, 1999, 104 minutes, Colour. Patricia Routledge, Nicola Redmond, Georgina Sutcliffe, David Calder, Malcolm Sinclair. Anybody's Nightmare is a British made-for-television movie, a star vehicle for Patricia Routledge. She is best known for her television appearances as Hyacinth Bucket in Keeping Up Appearances as well as Hetty Wainthrop Investigates. The film is based on a true story: an elderly woman dies, it seems by accident, drowning in a river. Her niece-in-law, a widow in her 60s with two children, is arrested for murder. Circumstantial evidence seems to indicate that she killed her aunt. The film shows the harassment of the accused by the police, the interrogations, the work with lawyers, the support of the family, the trial and her being a victim of the skills of the prosecuting lawyer. The film also shows the impact of being in prison on this kind of woman who has had little experience of this world. The film shows the attempts of family and friends to get an appeal. After six years, in a retrial, she is finally acquitted. The book on which the film was based was written by one of the friends who supported the accused, Angela Devlin (along with her husband Tim) played by Nicola Redmond. The film is well written, elicits sympathy. 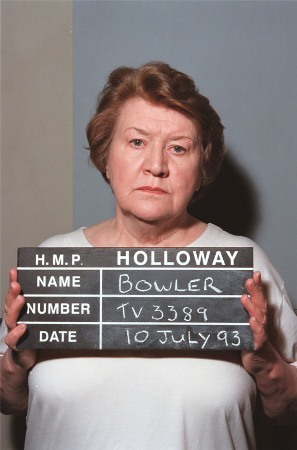 While Patricia Routledge reminds us of Mrs Bucket, she soon establishes an individual character for Sheila Bowler and her six years' experience of the law. David Calder and Malcolm Sinclair appear as lawyers in the initial trial. 1. Based on a true story, British justice, juries, trials, circumstantial evidence, judges? 2. The film as a star vehicle for Patricia Routledge, her performance, eliciting audience sympathy for a woman suddenly bewildered by the accusations made against her, her being a strong character and dominating in her family life, finding herself in prison? 3. British prisons, the sketch of prisoners in a British jail? 4. The emotional impact of the film, rational impact? Circumstantial evidence, juries, the justice of speeches and interrogations and cross-examinations? The role of the judge? 5. The introduction to Aunt Flo, her age, in the home, impatient with nonsense, the staff and their attitudes towards her, thinking she couldn't walk, going for the drive, her reliance on Sheila, love for the family, the puncture, the bikies, her waiting in the car listening to the music, her being absent from the car when Sheila returned, the attempts for help, the search? 6. Sheila Bowler, her work, helping with charities, giving Flo the extra ride, the blowout, her apprehensiveness about the bikies? Jane and Simon and her relationship with them, Jane and her concert, Sheila's reaction with the police, wanting to go to the concert, reassuring her children, going to bed? 7. The circumstantial evidence, her giving times for phone calls, Simon with his different times, her leaving Flo in the car, her talk with the man helping with the phone before phoning, his not seeing in the dark, cleaning her shoes, not having food in the house, the roll-up bed, her being the beneficiary of the will, the debts? 8. The police and their aggressive attitude, suspicions, judging her guilty? The interrogations, the insinuations? Her lawyer, the long questioning and her having to say, "No comment"? Her being allowed away, her arrest at home? 9. The trial, the jury, the judge, Mr Glass and the incisive nature of his questions? Her answering badly, the role of her own lawyer, his saying that she had crucified herself? 10. The guilty verdict, the consequences, her going to prison, the strip, the search? The room, the young prisoners, their attitude, the details of prison life, the black prisoner and her initial taunts, friendship? The role of the guards, the criticisms in the kitchen? Her wanting to be clean and tidy, referring to her as Mrs Bossy Boots? Her having the slight stroke, trying to play the piano? The visits from her family, the ordeal of prison, her having to make a decision about the appeal? 11. Jane and her devotion to her mother, getting the scholarship to Scotland but not accepting it, the initial meetings with Angela, the friendship with Angela, working with her on the details of the appeal, Simon, his moving out of home, his flat, willing to sell the flat to help raise money? Jane and her relationship with Peter - and her mother's seeming disapproval and then apologies? 12. The evidence, the experts, going to the river bank, demonstrating whether it was possible to climb down or to fall or slip, the role of the defence? The appeal, the television program? Angela and her support, the interviews on television and the prisoners watching? 13. Mr Glass, his skill at law, the skill in questioning, cross-examination? His continued presence at the appeals and at the retrial? The defence lawyers, their tactics, Sheila and her disagreement, the issue of the white lie and her refusing? 14. The appeal, being turned down, demonstrations for the home secretary? The hearing, her not wanting any lies, her handling the questioning better? 15. Going home, on bail, the effect of seeing the house, wanting to tidy up? Her presence at the retrial, the effect, the jury, her tears at the verdict, the letter that she had written to her children in case the verdict was guilty? The effect of prison on her, changing her character, personality, beginning to share something of her inner self? 16. The media, the reports of the death of Aunt Flo, referring to her as a black widow? 17. Themes of justice, innocence, the processes of law, mistakes?